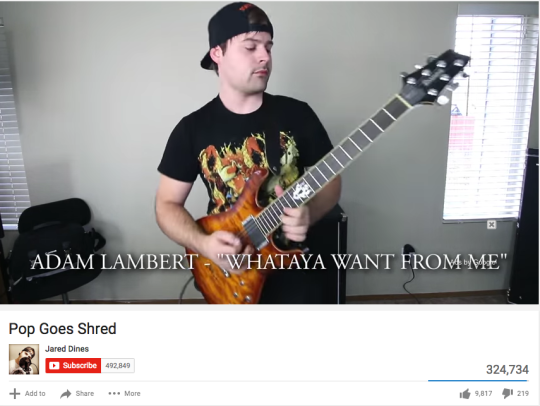 Rickards with a metal soundtrack… reader suggests we trick our audience (! )… a different kind of “trigger warning”… and more! “I never knew paying off debt was so profitable,” said the email from our microcap specialist Thompson Clark. As we’ve done much of this week, we’re in hot pursuit of opportunities immune, or at least resistant, to the Fed-driven ups and downs of the market. After all, a CEO can’t do anything about the Fed. But there are many things within a CEO’s control that can make his firm more valuable and enrich his shareholders. To illustrate the point, Thompson makes an analogy to a homeowner: “Someone you know owns their own home. Well, they partially own the home. A $100,000 home with a $75,000 mortgage means this friend of yours owns only $25,000 of it. “This $25,000 is his equity. Imagine his payments are $1,250 per month. Of that $1,250, let’s say, only $250 is going to pay the principal. The remaining $1,000 goes toward interest. Not a bad rate of return, huh? “Now imagine a scenario where your friend decides enough is enough,” Thompson goes on. “He’s tired of these house payments. “He takes on a second job to supplement his income. That helps. But most importantly, he cuts his costs down to the bone. The bare bone. No more trips or eating out. He takes the bus instead of driving to work. He’s living extremely frugally. “The benefit comes in his second year. Now he’s able to really increase the equity in his home. Let’s say he increases his payments from $1,250 a month to $3,500 per month. What’s his equity look like at the end of the year? Of course, companies can do the same thing. Thompson has spotted a company aggressively paying down its debt. He’s run the numbers and figures it could generate 122% within the next 24 months. Those are the sorts of opportunities Thompson uncovers all the time for his premium service, Agora Financial’s Microcap Millionaires. Starbucks? That’s grown 1,400% in the last seven years alone. Thompson figures it’s good for as much as 455% during the next two years. If you’d like access to this report — again, he’s releasing it this afternoon — you can get started at this link. “Post-Fed letdown,” as we called it yesterday, is stretching into this final day of the trading week. By day’s end yesterday, the major U.S. indexes had given up all their gains of the day before and then some. As we write this morning, we see nothing but red: The Dow has shed another 185 points. The S&P 500 has tumbled to 2,023 — racing toward last week’s close of 2,012. But stocks’ losses are other asset classes’ gain. Treasuries are rallying again, sending yields down: The 10-year yield is approaching 2.2%. Gold, after testing support near $1,050 yesterday, has rallied to $1,067 today. And that’s honest-to-God demand for gold, not a weakening dollar. The dollar index has pulled back, but not much, at 98.8. The Fed did deliver one surprise on Wednesday, in the estimation of Jim Rickards — “the specificity of the rate path from here. “As of now, the best estimate of the Fed’s path for rate hikes is 0.25% on March 16, 2016, 0.25% on June 15, 2016, 0.25% on Sept. 21, 2016, and so on through the Fed’s calendar in the year ahead and beyond. “Of course, nothing of the sort will actually happen,” Jim says. True, it will probably raise rates in March, and again in June. But then? It comes back to Jim’s big call for next year: “By mid-2016, the weakening U.S. economy, recessionary global conditions and vanishing inflation will make it apparent, even to the Fed, that they have raised into weakness. At the point, we can expect a ‘pause’ (amplified by forward guidance about no future rate hikes), and ultimately some rate cuts in late 2016. “This ‘back to zero’ scenario is based on a looming global recession affecting the U.S. In her press conference, Janet Yellen said she saw no signs of a recession in the U.S. However, the Fed has never correctly forecast a recession. The Fed simply never sees recessions in advance, and this time will be no exception. [Ed. note: If you missed Jim’s “Critical Warning No. 3,” you’re losing out. He’s issued this kind of update only twice before during 2015. Both times were about massive changes in the markets. This time it’s even bigger… and it has nothing to do with the Fed. Not directly, anyway. There are worse places to hide out in this churning market right now than consumer staples, says Greg Guenthner of our trading desk. “Hormel Foods is up a staggering 55% year to date,” Greg goes on. “Not bad for a company known for its canned chili. 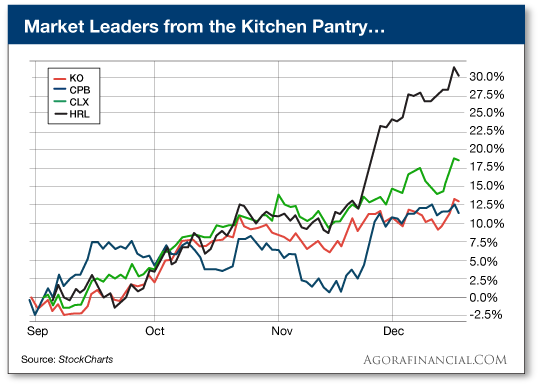 Along with Hormel, you’ll see that Clorox, Campbell Soup and Coca-Cola are all up double digits since Sept. 1. “As a group, consumer staples are a market leader. The Consumer Staples Select Sector SPDR (NYSE:XLP) is up more than 6.5% in 2015. Attention drone owners: You have scads of new federal regulations to comply with effective Monday. Happy Holidays! The FAA issued its long-awaited drone rules this week — a development we’ve been anticipating ever since we interviewed Makers author Chris Anderson nearly three years ago. “What if,” Anderson said here in The 5 in May 2013, “every morning, a drone would take off at the crack of dawn, do a lawn-mower pattern over the crop, and by breakfast you’d have the daily report — which, depending on whatever crop you had, tomatoes or wheat or grapes or whatever, would be able to tell you if you have a pest outbreak, a fungal outbreak or a disease outbreak? That kind of information turns out to be incredibly valuable to farmers because it can save a lot of money. So here goes: “The FAA wants every American to register every drone that weighs more than about half a pound, or 250 grams,” writes Scott Shackford at Reason. And that applies not just to new drone purchases. That’s right, the registry is retroactive! And if you do buy a new one, you must register it before you fly it outdoors. Registration will cost $5, but that fee will be refunded if you register before Jan. 21. (One fee covers all your drones if you own more than one.) You’ll then get a registration number you must put on the drone. The fines if you don’t comply? They’re stiff — a civil fine of up to $27,500 and criminal penalties up to $250,000 and three years in prison. Your government in action, Afghanistan edition: If anything, this is worse than our item a few weeks ago about the $43 million gas station the military built that should have cost $500,000. The inspector general for U.S. operations in Afghanistan is out with another blockbuster report, this one about reconstruction efforts by the U.S. Agency for International Development. USAID has overseen projects like a new wall around a schoolyard ($64,597) and an irrigation system in a village ($41,792). All told, USAID has spent $418 million over the last six years. And they’ve had the effect of bolstering support for the Taliban. “Why not change the name of the newsletter from The 5 to The 10?” a reader suggests, as the persistent topic of how-long-it-takes-to-read-The 5 popped up again this week. “Dave, kudos to Jim Rickards for the right call,” a reader writes — presumably referring to Jim’s call on the Fed raising rates this week, not to mention his gutsier calls about the Fed not raising rates any other time this year. The 5: Uhhh… We’ll take everyone’s suggestions under advisement. P.S. According to a survivor of the worst financial collapse in modern history, three of the four “currency collapse triggers” have already been activated in America. When this fourth trigger hits… it will be too late. What are these triggers? How can you prepare?